WASHINGTON — The United States and Norway entered into an official arrangement to mutually supply defense goods and services needed for national security in an April 12 signing ceremony at the Norwegian-American Defense Conference. The Norwegian Ministry of Defence’ national armaments director, Morten Tiller, and Eric Chewning, the U.S. Defense Department’s deputy assistant undersecretary of defense for manufacturing and industrial base policy, both signed the Security of Supply Arrangement to cement the arrangement. A SOSA allows “the DoD to request priority delivery for DoD contracts, subcontracts, or orders from companies in these countries. Similarly, the arrangements allow the signatory nations to request priority delivery for their contracts and orders with U.S. firms,” according to a Pentagon definition. The U.S. has entered into similar arrangements with eight other countries: Australia, Canada, Finland, Italy, the Netherlands, Spain, Sweden and the United Kingdom. And the U.S. has established subsequent codes of conduct with industry in Finland, Italy, Sweden and the U.K.
A prime example of such partnership, Tiller noted, is the 50-year cooperation between Norway’s Kongsberg and Raytheon. The agreement comes at a time where the U.S. is turning more toward strengthening alliances — a top priority laid out in the new National Defense Strategy. Chewning pointed to Norway’s strong role in the NATO alliance, participation in Operation Inherent Resolve, the country’s “innovative” industrial contributions to protecting U.S. forces in harm’s way, and the fact it is host to the Marine Corps’ pre-positioning program that aids in the defense of Europe’s northern flank. “This SOSA is another link in that strong chain that already binds us,” he said. 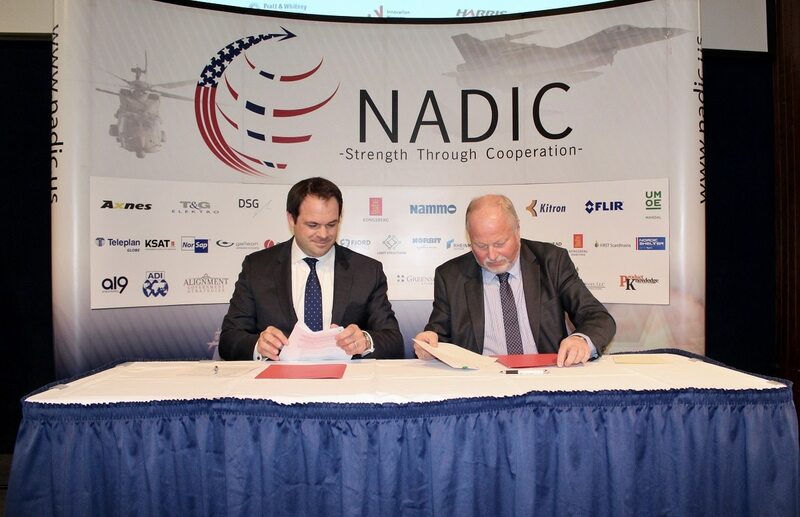 Nammo Inc. USA President Ola Skrivervik touted his company’s already strong presence in the U.S. — out of Nammo’s revenue of $570 million, 41 percent of that was based in the U.S. — during a panel at the Norwegian-American Defense Conference directly following the signing. Nammo also has roughly 400 employees based in the U.S. and is growing, he added. Last year, the company established a public-private partnership with the U.S. Navy’s Explosive Ordnance Disposal at Indian Head in Maryland to produce tactical solid rocket motors and develop new technology to boost the U.S. industry. Nammo is most known for turning around the Advanced Medium-Range Air-to-Air Missile (AMRAAM) program when the U.S. Air Force discovered reliability issues during tests with Orbital ATK-manufactured rocket motors in 2010. The company invested more than $12 million in an alternative rocket motor for AMRAAM and got the Norwegian Air Force to fly the motors to Raytheon’s production facility in Tuscon, Arizona, at no charge to the U.S. government in 2011. Nammo turned around a two-year production lag and put the missile program ahead of schedule. Nammo has made 50,000 rocket motors between NATO countries for programs like AIM-9 Sidewinder, RIM-162 Evolved Seasparrow Missile and AMRAAM, Skrivervik said. But doing business with the U.S. isn’t always easy. Nammo found itself at the center of an attempt to push congressional legislation through — two years in a row — that would have essentially shut out the company from providing rocket motors to programs like AMRAAM. That legislation was narrowly defeated on the House floor in May 2016. Skrivervik offered that the arrangement will “make a more formal commitment” to the work Norway and the U.S. do together. Skrivervik advocated that an important aspect to improving relationships between allies is the ability to plan and commit to efforts long term using open and transparent dialogue, which provides situations for industry to confidently invest. And nations should be encouraged to find more programs where cost-sharing is possible, he added. Skrivervik also said that conversations between industry and other governments is generally “very difficult” and finding new ways to interface with close allies is important. Also speaking on the panel, Steven Grundman, the director of Emerging Defense Challenges at the Atlantic Council, suggested the focus, when it comes to cooperation between allies, shouldn’t be about buying finished products but more about co-developing new technologies. Grundman also argued working in a small group, ideally a bilateral cooperation between countries, is the most efficient size in which to effectively collaborate.